Use this guide to help Imiya get her much needed sleep so she can pass her math exam. You can even earn a shiny new avatar while you are at it! Public disclaimer that I am, by no means, a Math’s Nightmare expert. But by using the strategy outlined in this guide, I was easily able to earn a spot on the top 50 high score table during reset. There is a common misconception that you need to be good at math in order to obtain the avatar. Let me assure you that it not true. What is important for getting the avatar is understanding the fundamentals of the game and then practicing the strategy I will explain later on. Let’s begin with going over the basics of the game. When starting the game up, you will be asked to choose the types of problems that you want and the level of difficulty. These choices determine how many points you can earn during the game. The type of problems that you choose determine how many points you earn for each correct answer. For addition you earn 5 points per answer, subtraction 10 points, product 15 points, division 20 points, and random 25 points. Then at the end of the game, your total score is multiplied by the level that you chose. Multiplied by one for easy peasy, two for potato counter, and three for brain tree. Every round of the game has 9 Babaas, each with a math problem for you to solve. As each round begins, the Babaas will be on the right hand side, moving left towards the fence.Their math problems will be in bubbles on the left side. Each math problem goes with a Babaa, and answering correctly will let that Babaa jump over the fence. Answer the problems in the order that they appear by clicking on the bubble and typing in the correct answer. You do not need to press enter, just type in the number! If you type an answer incorrectly, though, you need to delete it. You can either backspace, or double click to highlight it and type in your new answer. You will need to work quickly when playing this game, because if a Babaa’s math problem isn’t answered correctly in time, it won’t be able to jump over the fence. It will fall out of the dream and set off the alarm clock. That will wake Imiya up and end your game! You will also need to watch the clock! Do not let your timer run out or the alarm will also go off, ending the game. Your timer lasts for 60 seconds. Be careful, because the timer does not reset every round. Your timer will reset after rounds 3, 7, 12, and 17. Okay, so now you know how the game works. Let’s get to the part you are really here for - how to earn a high enough score to get the avatar! You earn the avatar by being in the top 50 on the high score table when trophies are awarded. It’s best to try for this during trophy reset (the first of each month). Trophies are usually awarded a little after 8:00 pm nst, so just be in the top 50 during that time! If you play in the morning, make sure you are watching the high score table throughout the day in case you get knocked off. You can usually end up in the top 50 with a score of 5,600 or higher, depending on the month. I always play on division, potato counter mode. This is the easiest way to earn the most points. All of the answers repeat themselves, so your key to being quick is to memorize them all. They are 2, 3, 4, 5, 6, 8, 10, 15, and 25. Take some time to practice typing in the answers quickly! Because you have to click in each bubble before typing in the answer, I keep my right hand on my mouse and my left hand on my keyboard. I have found that keeping three fingers on the numbers 2, 3, and 4 make it easy to quickly move to the answer that I am looking for, or move my right hand from the mouse to 0 or backspace if I need to. I watch my clock and try to complete each round in 15 seconds, or ¼ of the timer. There is a code to reset your timer - letimiyasleep. This code can be used only one time per game, so use it wisely! I try to get through level 10, then use it between rounds 10 and 11. Then you’ll easily be able to get through round 16 and part of 17, earning a high enough score! 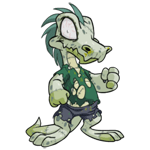 I was really intimidated by this avatar for a really long time. With a little bit of practice and strategy, though, it ended up being a lot simpler than I had thought. Just make sure to memorize the answers, click and type as quickly as you can, and keep a close eye on your timer. Also don’t let your fear of math inhibit you from trying for the avatar. I promise no matter your math ability, you will be able to attain this avatar. Doing those things and giving it a lot of practice will get you the avatar next reset! It was just a normal day for him. Like any other. By midnight, this particular day would have been over and out of his mind like the thousand ones that came before it.